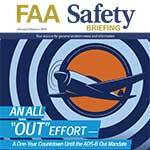 NAS Fallon is Trying to Modify Their Training Airspace. 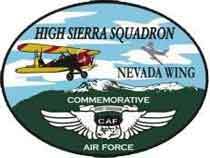 NAS Fallon is in the process of getting approval to modify their training airspace. 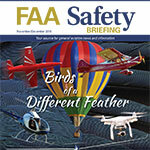 The changes could make it very difficult to fly east to several locations. Comments are open to voice your opinion about their proposed changes. On Saturday, October 27, 2018, the Carson City Airport will be closed for a VIP visit. Check NOTAMS and read the rest by clicking on the title. Carson City (KCXP) pavement closures this month. Click on the title to learn more. 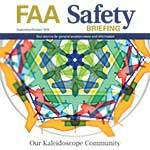 The September/October 2018 issue of FAA Safety Briefing explores the important role of community in general aviation. 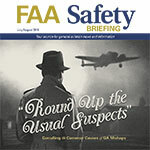 The July/August 2018 issue of FAA Safety Briefing uses a Casablanca theme to address a serious and potentially deadly issue: the persistently consistent causes of GA safety mishaps. 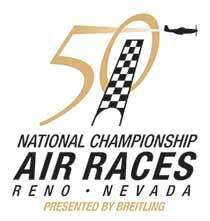 At their bi-monthly meeting on June 6th the Reno-Tahoe Aviation Group, our sister tenant organization at KRNO elected a new Board of Directors who then selected officers for the following term of office. A presentation on the KRNO Master Plan was given to the attendees of the RTIA (Reno-Tahoe-International Airport) Users Committee Meeting in the board room at KRNO. 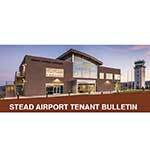 A link is provided to access the complete Master Plan proposal. 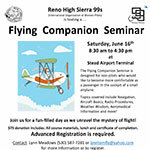 The Reno High Sierra 99s will be conducting a Flying Companions Seminar at the Reno-Stead Airport Terminal on Saturday, June 16th starting at 8:30 am. 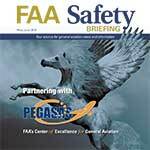 The May/June 2018 issue of FAA Safety Briefing focuses on the FAA’s Center of Excellence for general aviation research, the Partnership for Enhancing General Aviation Safety, Accessibility, and Sustainability (PEGASAS).